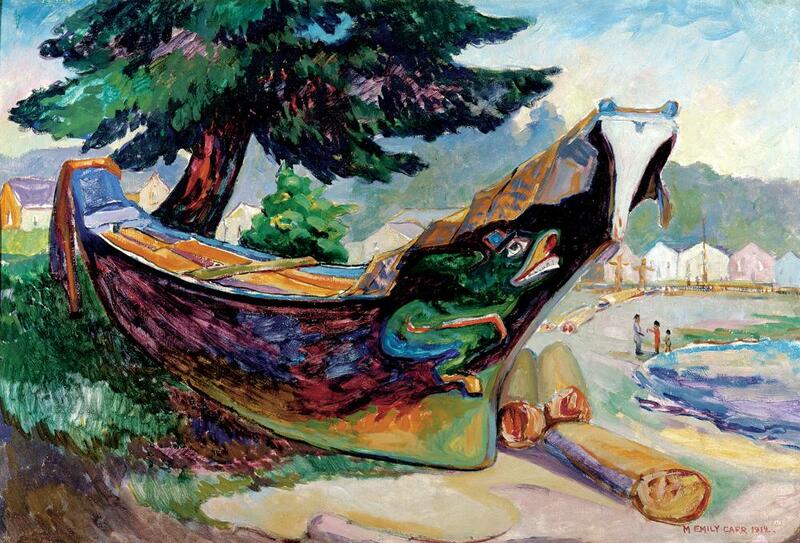 Yesterday I took the younger to check out the Emily Carr exhibit at the AGO. Being a member of Trudeau Generation, receiving my education from the church and CBC, an awareness of Carr was deeply embedded within my consciousness. Not so my daughter, however, so this introductory exhibit came at an ideal time: at the crest of a teacher's strike. Off to the city we went. 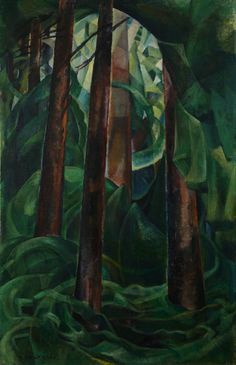 From The Forest To The Sea is well-executed -- a brisk tour of Emily Carr highlights, peppered with well-chosen arcana to draw out a nuanced sense of the woman's character, inquisitiveness, even bitchiness. I could have stood to see a bit more of the latter, frankly. Carr evidently had quite the life-force. In her later years her neighbors regarded her as an off-putting kook -- the old gal with a penchant for donning a hairnet and walking her assortment of pets in a pram. The curators took pains to prevent this late-in-life behavior from becoming the definitive portrait of Carr. Which led me to wonder: when did the Eccentric Artist cliche become a liability? Another curatorial tic that induced me to eye-rolling: an apologetic stance toward her "cultural appropriation" of indigenous artifacts -- via her (voluminous) portraiture of totems, masks, and the like. To be fair, our contempo cultural babysitters took pains to present Carr's penchant for "speaking on behalf of my Indian brothers" within the context of the times. At the turn of the 20th century, official government policy regarding the country's First Nations required absolute assimilation -- children who didn't fall to malnutrition or the plagues of the day were rounded up and deposited in residential schools, while totem poles and canoes were physically appropriated and shipped to approved cultural institutions, or simply destroyed. Carr responded with outspoken horror and defiance, devoting herself to portraiture of the disappearing totems in a personal effort to keep the artform alive -- a person, a woman, whose moral sense was out of sync with her time. That she was too obsessed/obtuse to note any misgivings the people she was keen to "save" might have had toward her enterprise is hardly surprising. One shudders to think what virtues our grandchildren will be apologizing for in three generations' time. That being said, the display as curated was a personal revelation. Two late-mid-career works, Indian Church and Wood Interior, are presented as keys to the larger body. It's an astute bit of positioning. Here we have Carr's studied aesthetic and moral indignation displayed to great effect, in a manner that perfectly suits our precious contemporary palate. 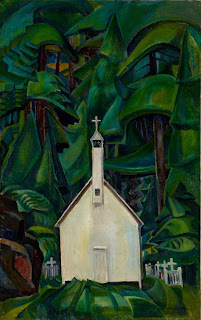 Instead of her usual reverential treatment of totems, Carr presents the incongruous clash of a victorious Colonial religion, with its overflowing graveyard, its absurd angles and coloration, braced against the sweeping grandeur and impenetrable mystery of the forest -- the original source of religious reverence for indigenous peoples. And who among us isn't up with that, really? Seeing these pieces first does have an unsettling effect on the rest of the exhibition. The earlier pictures and mock-ups of "Indian" artifacts make up the bulk of the show -- and this exhibition presents just a well-culled sliver of her vast collection. Many of her most recognizable pieces are there, as well as the lesser attempts that lead up to these triumphs. After a while, it gets to be a bit much. "Really, Emily: another canoe?" "I mean, it's beautiful and all, but..."
I imagine her friends among the Group of Seven must have felt some of that. Late in life, Lawren Harris apparently gave Carr a hard nudge to focus exclusively on landscape. And it is these final paintings of Carr's that resonated most deeply with me. She shifts into a mode strongly reminiscent of Van Gogh -- somewhat surprising, given how she was, at this late point in her life, happy to remain ignorant of artists she'd not actually met. 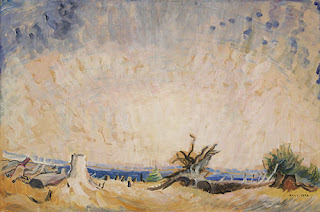 In a landscape like Stumps and Sky (1934), I got the sense that this clear-cut forest is releasing an anarchic apocalyptic energy to the four winds. Similarly, my personal favourite, An Upward Trend (1937), which viscerally communicates what our very elderly often speak of: a perceived internal prompting to exceed the limits of the sky. Sounds New Agey, I know. I expect Carr would have fostered the expectation, then crustily asserted she was no such thing, dammit. 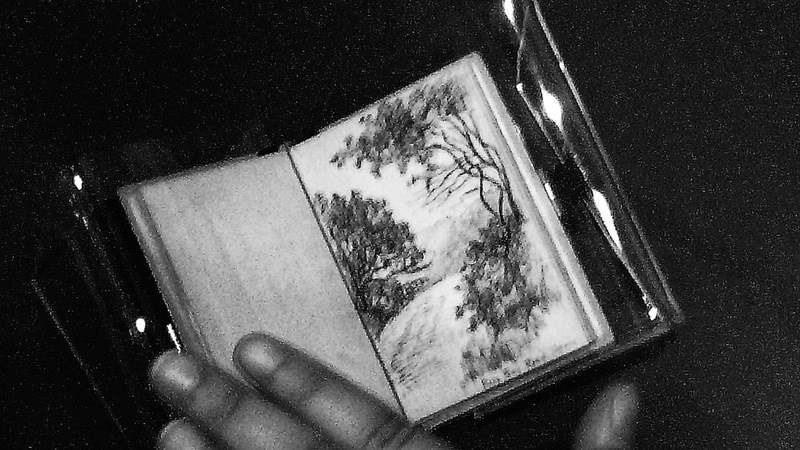 The kid enjoyed Carr's early sketchbooks, tiny things with incredibly articulate pen-work. Presented here in an artfully-rendered crappy phone shot. 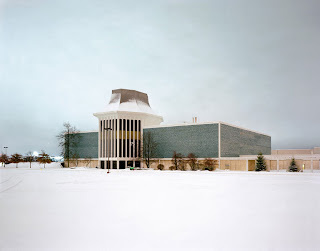 From The Forest To The Sea is at the AGO from now until August 9, 2015. Bonus: until May 10, you can also check out this sassy Basquiat exhibit. 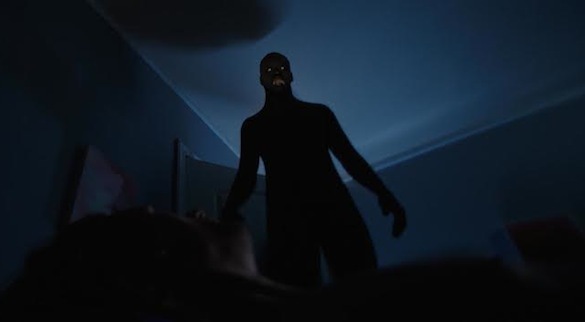 Sleep Paralysis is something I'd given zero consideration, until I read Regan Reid's timorous review of The Nightmare -- "the terrifying doc I could have starred in." After reading this peaking-between-her-fingers account, I wondered if I couldn't also qualify, not as a star, but certainly for a bit-part. I was surprised by how many phenomena I could tick off as stuff I'd experienced. "Dark presence" -- check. "Creature squatting on my chest" -- check. "Can't seem to move" -- check. "OK, good news, bad news. The good news is... No, wait: I started wrong." Most of this was in my 20s, mind you. These episodes slowed in my 30s, even moreso in my 40s. I'll be 50 in June, and the last time something like this happened was two years ago, in the summer. And while I'd never characterize these events as "pleasant," they were never awful enough to inspire an actual fear of sleep. Rather, much of the ephemera was cause for curiosity. Exactly where is all this fear coming from? I could often pinpoint the source of my anxieties, sometimes even as the events unfolded. The last episode, for instance, occurred shortly after I'd returned from a family visit on the prairies. A Dark Presence hovered over me, pinning my shoulders to the mattress, and telling me awful things. "Your father will die," he said, "then YOU will die!" The physical sensation of actual tears cooling on my cheeks woke me up. When I was able, I sat up and mulled it over. There wasn't much to argue with, really. Anyone with an eye on the event horizon would have to agree with my faceless tormentor -- in fact, since death is inescapable, he was articulating the desired order of things. So it has always been. I've had the general sense that these phenomena could needle me, torment me even, but do no real harm. What else you got, there, bub? Grinding of the teeth -- now that's genuinely worrisome (and addressable). The people who endure these trials all have different stories and various causes for concern. It's a solo journey for everyone, alas, so you learn your psychonaut jiu-jitsu on the fly. But psychic self-defense is a learnable skill. 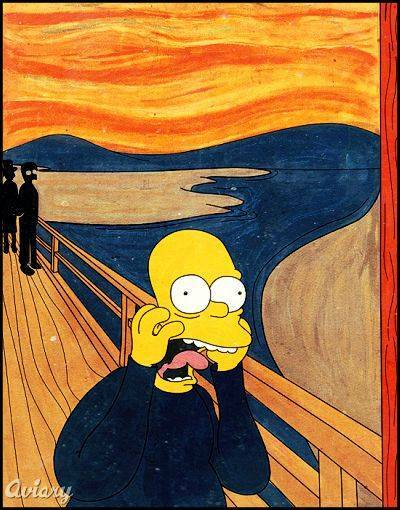 The plasticity of consciousness is really quite marvelous. Karen Emslie has intuited a way to transition from paralysis to lucid dreaming -- which can be a lot of fun, but also beaucoup scary in its own right. It is, however, greatly preferable to lying passively and taking whatever your id is keen to throw at you. Dream-life as dojo. PJs as gi. So here it is, third day into playoff season, and I'm already digging my trenches for a prolonged social media flame-war over violence in hockey. I'm an enlightened, sensitive sort: no place for it on the ice, sez I. Now there are some who say I don't know balls from pucks, so I work myself up into high dudgeon, begin composing a response to the tune of, "Look, Herr Troglodyte: hockey is an evolving sport. If you don't believe me, just consult the eminently wise and super-informed Ms. E., over at her pro blog. Link to follow:"
Followed by an hour of frantic searching for cached sites of those postings. Alas, such were not to be found. It seems you have been reduced to a Twitter feed, and the occasional spirited exchange with ... Colby Cosh? Say it ain't so! I mean, not the Colby Cosh part -- he's a blowhard, enjoys a good tussle, so hey: go, E., go. And I am grateful for the archival trove you and Google have left intact. But the stuff you wrote for The Score was primo material, E. Most of it transcended -- way transcended -- the immediate concerns of embroiled hockey fans watching from the stands and sucking on their sweater-sleeves. It had djenn-yoo-wine historical perspective, the heat of true love and the cold steel of informed conviction. It had snap and vigour, and to casually-engaged readers it connected like a hay-maker to the chops. Responses were either wild and foolish swings from the punch-drunk, or the "No mas" of the wiser combatant -- there was no third way. We need that material, E. -- now more than ever. Surely your agent has worked out a deal with Random-Penguin? Or, failing that, couldn't you assign some minion to format these pieces for self-published glory? I, for one, commit to purchasing a copy for the reference libraries of every household in my extended family. That's, uh ... fifteen copies -- plus another dozen (no, make that fifteen, for an even thirty -- to begin with, of course), to inflict on unsuspecting newcomers. Please, E., for the love of hockey -- re-release that material. This isn't the sort of review that would ruin my initial viewing of any movie, but it does contain mild spoilers, so consider yourself warned. I recently watched the duration of A Walk Among The Tombstones, despite the fact that it relies, heavily, on two tropes that usually qualify a movie for immediate ejection: female mutilation, and child endangerment. Admittedly, its use of those tropes also heightened my emotional investment in the narrative. These were bad guys I really, really wanted to see "get theirs." And I was fairly confident they would, because the movie is based on a Lawrence Block novel, and though Block can be gritty and grim, he's not one to indulge in tragic conclusions. In fact, Block was another reason why I kept watching. I've read a few of his books -- he's a deft pulper, an estimable hack. If you've been reading me for any length of time you know those are qualities I generally admire. But Block's never quite become a habit for me, because his heroes can read as so damn tough -- often too damn tough to relate to. This could be a problem in a movie like Tombstones, because once the people start talking, they're speaking vintage Block dialogue. Enter the third reason I watched this movie to the end: Liam Neeson. When Neeson's "Matt Scudder" corners a pervy suspect, who wonders why bad things keep happening to him, Scudder simply says, "You're a weirdo." On the page, that reads as cold. But Neeson's delivery, while blunt, contains just the faintest trace of empathy, if not sympathy. It's enough to get the suspect to disclose a key revelation -- and enough to keep me watching, because I'm becoming increasingly invested in Neeson's character. Things end where we expect them to in a movie like this -- very violently. It's not a cartoonish Taken sort of violence, either, but rather the more genuinely physical violence that Neeson displayed in Rob Roy. Which, now that I think of it, is probably the movie that launched Neeson's improbable career as the single most convincing action star to hit the screen since Clint Eastwood. Easter Saturday. The elder girl took off with her mother to check in on Nana. The younger was ensconced in her room, attending to homework. The perfect opportunity for Yours Truly to slip downstairs, get the laundry going, and engage in a little cathartic blubbering. 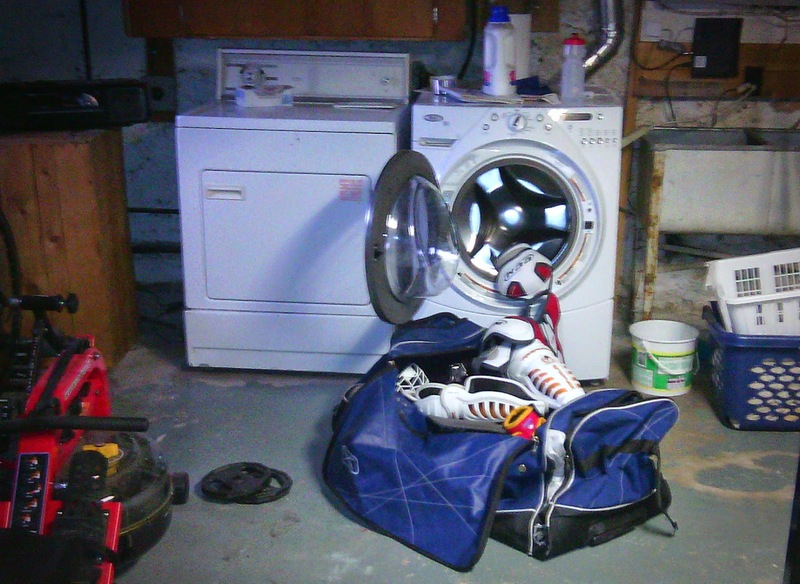 I tossed the elder's ringette jerseys and equipment -- everything but the skates -- into the washer, hit "power," then sat and watched the cycle begin. And, yes, there were a few tears, some whuffling sobs, but nothing close to the head-in-hands-go-to-pieces episode I'd anticipated. This was likely her final season of organized ringette. There's an outside chance she'll sign up again in the fall and play with some variation of the team she knows and enjoys. Were that to occur, I could envision getting lured back into the coaching staff. But a number of girls are moving on to higher ed, international travel, or some combination of the two -- the new team would be a markedly different set of girls than the one she's grown up with, so I'm not expecting it to appeal. Another option: she could join an open team in a house league, just for the joy of the game. There's also a guy in town who's formed his own ringette league, on behalf of his university student daughter. He's a solid character I've got a lot of admiration for, but man oh man -- that strikes me as just a bit extreme. I can't help wondering if, had he not been able to add just one other daughter in his otherwise uninterrupted brood of boys, he mightn't be devoting his off-hours to some other passion. Maybe not. In any case, I won't be following his example. Memories like this one kick-spurred the tears. More recent memories, however, kept the floodgates from opening. This was partially due to an absolutely sensational Ottawa tournament we'd enjoyed three years earlier. In the penultimate game, the girls pulled off an entirely unexpected win that had all the cliched elements of a sports weepie -- facing off against a larger, more aggressive (French, even!) team strongly favoured to win; coming up from behind; still down by one goal with less than two minutes left in the game; a tying goal scored by the centre-sniper; winning goal, mere seconds from the end; and above all, a depth of character that surprised everyone, including the coaches. Back at the hotel, we lit for the pool -- coaches and parents nursed drinks by the side, the girls took over the water and horsed around, not like 15- or 16-year-olds, but like they were eight years younger. We got clobbered the next day's game, but it didn't matter. That lightning doesn't fit inside a bottle, of course. A subtle sense of diminishing returns was almost inevitable, really. And it was helped along by growing evidence of other coaches and managers cooking circumstances to give their teams an edge -- including one idiot who swapped in a bunch of A-players, but kept the regular names on the game roster (had anyone been injured in that game, he'd have been sued into oblivion, because league insurance quite reasonably does not cover falsified rosters). Close it all off with a final tournament on the other side of the city, organized so ineptly as to suggest malign intent (cause for brooding meditation, as we painfully navigated rush hour traffic -- twice -- on Thursday, and the hours between bracketed games in the morning and evening of Good Friday(!)) and I was frankly relieved to be doing laundry while the play-offs took place 150 km to the west. Besides, I'd been coveting my daughter's newer, lighter, more compact hockey bag for the last two years. It's daddy-o's now, heh heh! So thanks for the bag, kiddo. And thanks for the memories. Your passion for this sport pulled me into experiences I'd never dreamed of exploring -- or enjoying -- as deeply as I did. I am one blessed dad. I am a blessed man -- period. Oh, hey -- where'd that hankie go? I pulled on my boots and hit the asphalt. A quarter mile out of town, a black RAV ahead of me slowed down and came to a stop. It was O__, the retired teacher. She rolled down the window. “Maybe take a stick with you. Or just tell ‘em another dumb joke. 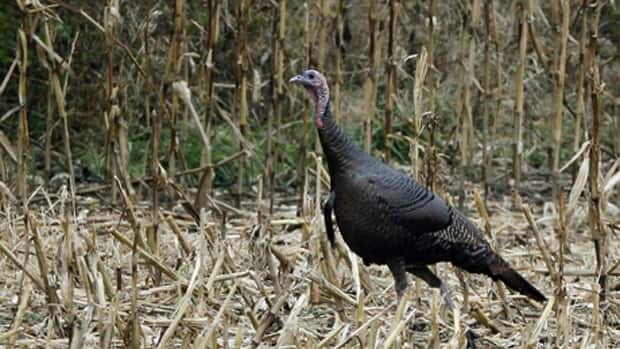 That might get ‘em running.” She made a point of peeling off, and I resumed my walk. Fifteen minutes later, I spotted the birds. They’d left the ditch for a field of levelled corn. They didn’t look dangerous to me, but they were certainly large enough to pose a threat, were they of a mind to.